I recently watched a wonderful TED presentation given this past February by the inventor of the Internet, Tim Berners-Lee. Tim’s presentation focused on the premise that linked data (as he calls it) will revolutionize the way we use, parse, and compile information (mostly numbers) found on the world wide web. His presentation is great and he’s looking for help propagating linked data, so if you have a few (16) minutes, I suggest you watch his TED talk. Tim’s presentation got me thinking about the future of search. 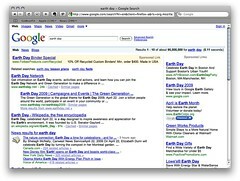 I started to wonder how far off we are from the elusive ‘semantic web’ and realized that although we’re not there yet, there are companies using branded content creation and distribution platforms as a stepping stone to the semantic web and, in the process, GREATLY enhancing search functionality on the web. 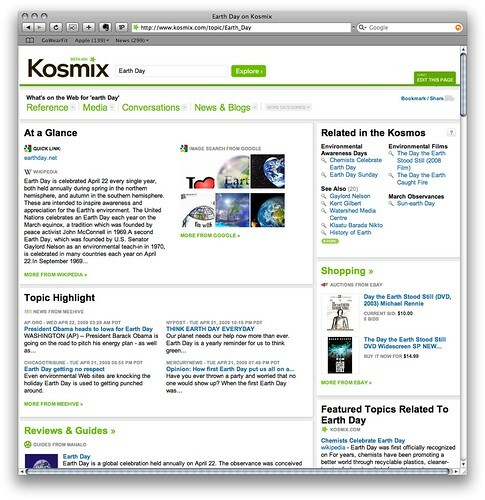 One of those companies, and a real pioneer when it comes to context sensitive search, is Kosmix.com. “Kosmix is a guide to the Web. The site (www.kosmix.com) lets users explore the Web by topic, presenting a dashboard of relevant videos, photos, news, commentary, opinion, communities and links to related topics. 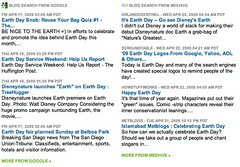 Images: As you scroll down the page there are some wonderful image results, showcasing Flickr and Google image search results for Earth Day. As you hover over an image, a pop-up thumbnail appears to give you a better look. 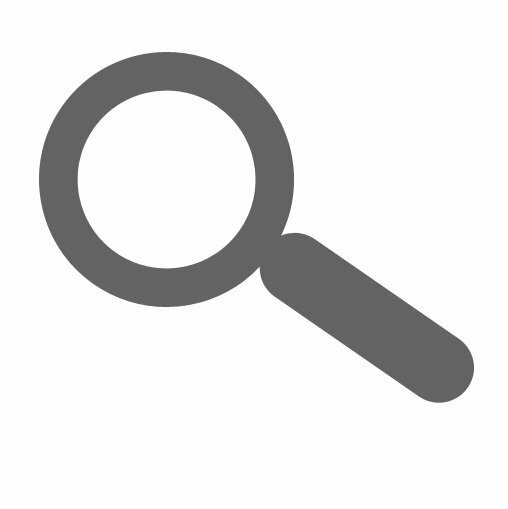 Videos: Kosmix uses a wide variety of sources for delivering video search results. 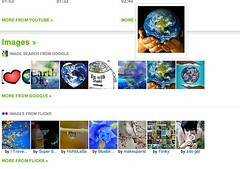 Many of the results will play inline (meaning in the page itself), enabling users to watch the videos without leaving. In addition, you’ll find ‘how to’ videos for specific topics. Blogs: Of course, there are wonderful, timely, and relevant blog entries on the page, allowing you to read the first sentence (or so) before you decide whether to dive in deeper. There are far too many wonderful features in the Kosmix universe to detail here: documents from Scribd, related Facebook groups, Twitter Search results, reputable newspaper articles, answers from Yahoo Answers, forum posts… the list goes on and on. So, What Does Kosmix Mean to You as a Content Creator? If you’re creating and distributing content for you or your company, you must start distributing your content as widely as possible. 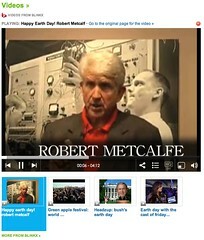 You must distribute it on trusted platforms: videos on Vimeo, images on Flickr, entries on Wikipedia. You must participate in trusted branded content creation platforms like Amazon.com reviews and in social media platforms like Twitter or Tumblr. The future of search does not lie in Google’s disorganized monopoly of paid search results and indecipherable, keyword-optimized, co-opted and click-through ranked searches. It lies in context-sensitive, comprehensive, multi-threaded search results from ‘trusted’ content creation and distribution platforms like Kosmix. I challenge you to search for yourself or your company on Kosmix. What do you find? Is it relevant? Is it content you created and propogated? If not, start really thinking about your content creation and distribution strategy. Maybe it’s time you really started to extend your reach by providing your consumers with a broad context for their interactions with your brand. Kosmix has just recently started to move up the search food chain. With almost 3 MM unique visitors a month, they’re merely a blip on the search radar screen, but they’re rapidly gaining ground. If you aren’t using Kosmix daily, that’s okay. At least use it as a barometer for how far and wide your content is distributed and can be consumed. What do you think of Kosmix? Where do you think the future of search is headed? What’s your favorite feature of the Kosmix interface?